Brooklyn is properly known as Kings County. During New York’s Gilded Age, Sugar King Henry Osborne Havemeyer and Coffee King John Arbuckle made sure the borough lived up to its name, building their grand industrial empires on the shores of the East River. 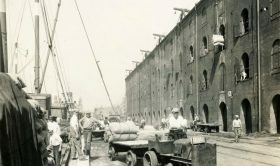 By the turn of the 20th century, more sugar was being refined in Williamsburg and more coffee roasted in DUMBO than anywhere else in the country, shaping the Brooklyn waterfront and NYC as a preeminent financial and cultural center. The history of coffee and sugar in this town is as rich and exciting as these two commodities are sweet and stimulating, so hang on to your homebrew and get ready for a New York Story.